One of the organisers of the Suriyur Jallikattu noted that previously, the event saw about 25-300 tamers participating, mostly from nearby villages. CHENNAI: The 2017 Jallikattu protests have had a significant impact on the way the traditional sport is being played in Tamil Nadu with the number of bull tamers increasing and population of Jallikattu bulls rising in the past two years. Take the Suriyur Jallikattu in Tiruchy district. It is one of the most famous of Jallikattu events in the state. Despite this, before the Jallikattu ban and pro-Jallikattu protests, the participation in the event was relatively low. One of the organisers of the Suriyur Jallikattu noted that previously, the event saw about 25-300 tamers participating, mostly from nearby villages. “But after the pro-Jallikattu movement many more youngsters started participating. This year we had some 400 participants,” he said, adding that youth were travelling from further away to participate. A similar effect has also been seen in the cattle population, claim those in the know. Chinna Gounder, a Jallikattu bull owner in charge of the Mannaparai cattle market, said that following the ban, the number of Jallikattu bulls was on the decline. However, since 2017, more people were coming forward to rear Jallikattu bulls. “The population of Jallikattu bulls has risen and this year more than 5,000 new Jallikattu bulls were bought and prepared for the sport in Tiruchy district alone,” he said. He added that the hype had also created a massive demand for Jallikattu bulls, resulting in the price of a decent bull skyrocketing from Rs 50,000 to over Rs 5 lakhs. President of Alanganallur Jallikattu Organising Committee J Sundararajan, who hails from a family which has been organising Jallikattu for over five generations, said that since 2017, funding has been easier to come by. “Jallikattu was a popular sport even before the protests and we managed to get enough sponsors. However, flow of funds for Jallikattu has increased tremendously since the protests,” he said, adding that prizes worth nearly Rs 1 crore were distributed at the Alanganallur Jallikattu this year. However, since the ban was lifted, and the pro-Jallikattu protests occurred, the sport is now ‘officially’ conducted. At the 2018 Alagumalai Jallikattu, nearly one lakh people attended though only 30,000 were allowed to watch the event, he said. However, all 600 bull tamers who have registered to compete are from outside Tirupur. Palanisamy said the youth of Tirupur were more interested in joining industries than taming bulls. “Only a person who has mastered the art is allowed into the arena. One has to learn how to tame the bull from childhood,” he said. 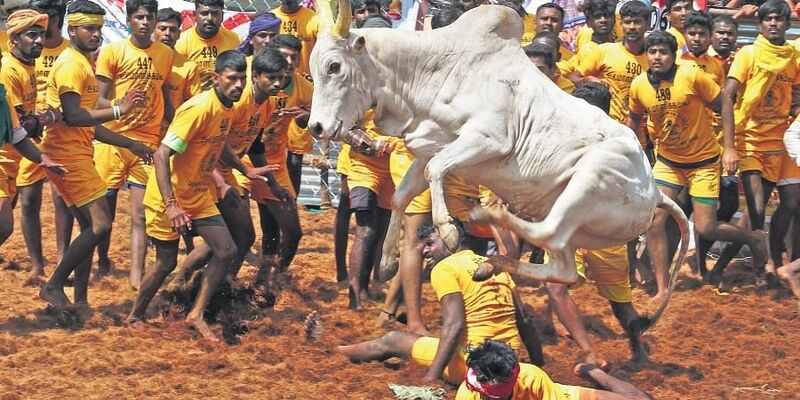 V Rajadurai, 25, a finance accounts manager in a private firm in Tirupur, said, “Kaalaya adakkaradhu rathathula oori irukanum (Taming the bull should be in your blood).” A native of Papampatti near Palani in Dindigul district, Rajadurai said he had been living in Tirupur for a decade. “We were taming the bulls in our village. After migrating, I was missing what I had at home. When Tirupur hosted its first Jallikattu in 2018, I felt alive,” he said. Like him, 28-year-old A Muthupandi from Kamatchipuram in Theni district said amateurs could not survive the raging bull in the arena without proper practice. The downside of the renewed interest in Jallikattu is that some misguided youth fail to adequately understand the dangers of the sport. “I am an engineering graduate. My village peers and I have been participating in Jallikattu for seven years. We practisingticing at least three months before the event as we need time to train and master the techniques of taming the bull,” Govidhan, a bull tamer from Suriyur, explained. However, due to the social media hype, many youths think the sport is easy and try to take part in the events. “Their carelessness is not only harmful to them but also endangers other participants during the Jallikattu,” he said. T Rajesh, a Jallikattu bull owner and state president of the Tamil Nadu Veera Villaiyattu Metpu Kalagam agreed, adding that it was important they train first. However there are some who fear that the strict norms have made it harder for events to be organised. “Jallikattu is not a leisure sport for Tamilians, but a tradition that establishes the identity of a hard-working, self-sufficient, powerful Tamil. Jallikattu also symbolises a cordial man-animal relationship. For the owner, the bull is a member of the family. As the government implements strict norms, many of us hesitate to participate in the sport,” said S Raja, who rears 12 Jallikattu bulls at Salapalayam. “First of all, those who want to organise Jallikattu should apply to the Collector who will inspect the selected site with revenue and police officials. They submit a detailed report to the animal husbandry department and then approval will be given. The process could take three to five months,” he complained. Meanwhile, Jallikattu events can be sites of caste assertion and, therefore, oppression. Caste dominance was the reason the Avaniyapuram Jallikattu this year was conducted under the watchful eye of the courts, to ensure no community was left out. Kathir, executive director of Evidence, an NGO for Dalit welfare, pointed out the problems inherent in the way the sport is organised. Jallikattu was conducted as part of temple festivals and the dominant community —caste Hindus — conducted the festivals. “When Dalits are not even allowed to enter the temple, how would they be allowed to participate in Jallikattu,” Kathir asked. K Muni Veeran, a bull tamer from a scheduled caste community, said he had never faced caste discrimination. “I have participated in over 60 Jallikattu events and never faced caste-based discrimination. But my father, who was a tamer, had faced such bias,” he said.